Landon, our newest child, has taken all of my hair. Days like today remind me why I’m truly grateful. I’m blessed to say our family has welcomed a new addition, Landon, who was born 8 pounds and 8 ounces and is already giving his father anxiety. My family and friends have known for some time that Landon was on the way, but I wanted to take a moment here to remark upon his existence and what it has meant for my family. Landon means of the long hill. It’s an old English surname. When I think of the long hill, I think of San Francisco and it’s many hills, like the one at my grandmother’s (his great grandmother!) house. His middle name, which I’ll omit here for the sake of privacy, means “who is like God.” It’s an acknowledgement of our faith. We have needed our faith over the past couple of weeks. When Landon was born, he came full term and at a good weight. All signs pointed to an excellent delivery and a healthy baby boy. Over the first two days, Claudia and I bonded with him at the hospital as she recovered and he went through his newborn tests for things like Jaundice and hearing. It was over the course of these initial days that it became clear that Landon was not breathing well. His oxygen level had tested low and the doctors were concerned he wasn’t taking the time to breath while he was eating and crying. We were told, because of this breathing problem and no signs of a physical issue, he would need to be monitored for at least three days. After being reassured it was a behavioral and “maturity” issue, we told ourselves to be patient and not worry. 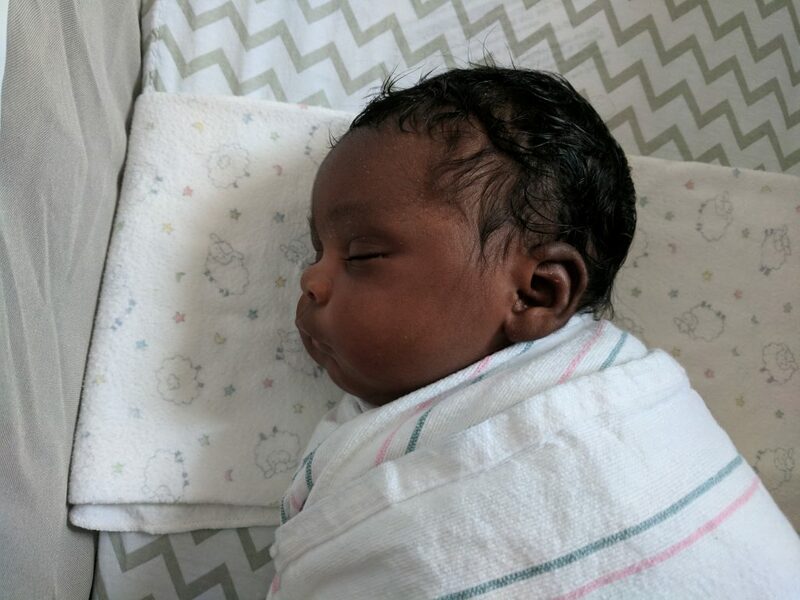 The thing is, as I later learned, when it comes to monitoring the oxygen level of babies, any dip below the ideal threshold triggers a new monitoring period. So before the three days were up, Landon’s oxygen level had experienced another dip. And then another. And then another. He would spend the remaining week in the nursery monitored by a cadre of nurses who were watching for any spells. We were all waiting for a light bulb to click, for Landon to learn to pause and take in air while feeding and crying. And we began to worry, or at least I did. I could hear him struggling to breath. Every snort and every sniffle sounded strange to me, even though every baby makes the same noises. The breathing problem was getting to me. Landon was being monitored for his oxygen level. After some time in the nursery, the doctors decided to put him on oxygen to help open up his lungs and spur along his own natural breathing. The idea was give him some time with oxygen and then cycle him off as he instinctually figured it out. 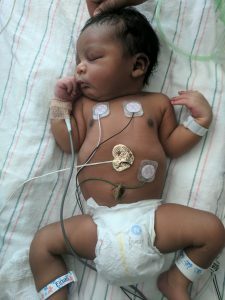 And while I believe my boy is one of the cutest babies on the planet, seeing him with oxygen was jarring. I should note that my wife is a nurse. She fully understood the implications of all of the decisions the doctors were making and was completely comfortable with it. But me, being a softy of a father and a journalist, was the one shaken by the visual spectacle of blinking monitors and wires attached to my boy. 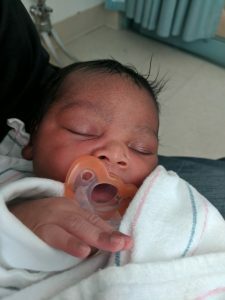 We spent a total of three days in the hospital after Jalil was born and I was starting to reckon with how abnormal this situation was becoming. My wife suggested I go back to work so I could put my focus elsewhere, which I did. And I waited. I waited almost two weeks from the day Landon was born until the day I was able to take him home. Just as the doctors had said (with Claudia backing them up), Landon just needed time to figure it out. He was cycled off the added oxygen and went three straight days with no spells. We took him home last night. If there’s one thing I’ve learned about myself in these last two weeks, work is a needed distraction. I’ve also learned how much of a calming influence Claudia is on me. I’m couldn’t be more thankful for her. I told Claudia that we’re going to hold this over Landon’s head. He came into this world giving his father anxiety and there’s no reason that I won’t chide him about it when he’s older. But I couldn’t be more grateful that he is here now and that he is healthy. So I’ll give him a pass for at least a couple of years. Maybe.